Objective: Only a limited percentage of persons with MS (pwMS) participate to multidisciplinary rehabilitation (MDR) because of poor support, knowledge and motivation. We reasoned that pwMS should be more effectively prepared to increase their adherence. We implemented an innovative collaborative approach, called “brief highimpact preparatory experience” (b-HIPE), inspired by an overarching model based on the interplay between competence, motivation and opportunity to increase in a short time awareness and motivation of pwMS. Methods: B-HIPE integrates physiotherapy, mindfulness, sailing, healthy diet, and cultural activities to be experienced in a convivial form at a beautiful seaside location in Sardinia. Sixteen pwMS participated to 3 successive one-week editions of the b-HIPE, co-sponsored by the Rotary Club of Milan and supported by researchers of our Institute and of partner associations. The feasibility was assessed with structured questionnaires and free reports concerning accommodation, logistics, coordination, social climate and the specific activities proposed. For this pilot study we used a single-group design with repeated measurements at baseline and post-intervention. The SF-36 QoL scale was the main outcome measure, the Fatigue Severity Scale (FSS), the Berg Balance scale (BBS) and the 9 hole peg test (9HPT) were the secondary outcomes. Results: The approach was feasible. Scores on several FS-36 scales and secondary outcomes were significantly improved. Participants’ satisfaction with all aspects of the experience was above expectations. PwMS became more motivated and aware of physical and mental resources, all learned to sail adapted monohulls, strategies to master stress and to modify their diet according to specific recommendations. Conclusion: B-HIPE is safe and feasible. The interplay of multiple factors produced in a very short time the expected changes in participants’ attitude toward a healthier lifestyle. A monitoring program is ongoing to assess long-term effects including adherence to hospital-based MDR. Multiple Sclerosis (MS) is a multifactorial central nervous system disease with no definitive cure. Pharmacotherapy can delay the appearance of significant disability mostly in its early phases, while rehabilitation gains priority in the later progressive phases of the disease. The latter can be declined into many types of intervention dealing with motor, balance, sensory (pain), cognitive, respiratory, and sphincteric dysfunctions as well, which can be combined into a multidisciplinary rehabilitation (MDR) program. Besides rehabilitation, any physical activity (PA) is regarded as key to improve well-being and preserve functioning in pwMS, independently of disease severity  as PA can be reduced in up to 70% of persons with MS (pwMS) in the early phases of the disease . When the disease progresses, comorbidities also lead to a progressive decline of health-related quality of life (HRQoL) . As a consequence MDR becomes more articulated, less sustainable and available  and eventually less effective . Another problem limiting the impact of MDR for chronic MS is poor adherence [6,7], which has multiple determinants. The lack of supportive resources at home and in the community and negative feedbacks may decrease participation or cause drops-outs. Personal issues such as discouragement, depression, poor understanding of the rationale and of potential benefits also play a major role for many pwMS , who may become victims of the so-called disengagement cycle . A passive attitude is intrinsic to the role of clients of sanitary systems that are more and more strictly organized, sectorial, constrained by economic issues [9,10], less flexible, and less attentive to prevention and to individual global health targets. More recently, it has become clear that MDR can achieve better results if pwMS are allowed a more active role [11,12] and if more global lifestyle changes are addressed to. The latter include modification of maladaptive habits (eg. smoking, alcohol, poor diet, obesity, social withdrawal) and the promotion of psychologically positive attitudes [13-15]. Regarding food and diet, the pathogenesis of MS has been recently linked to an alteration of the resident gut microbial commensal flora (microbiota) and to the interplay between the latter and the immune system . Dietary components such as fibers and vitamin D acting on microbiota composition could modulate immune responses and thus be used to obtain beneficial outcomes for pwMS [17-19]. Basic psychological needs determining the participation to PA have been analysed in healthy individuals . Intrinsic motivation, relatedness and competence, are all predictors of PA engagement. According to the Hierarchical Model of Motivation  social factors such as a task-involving climate are positively associated with basic psychological needs. Furthermore, intrinsic motivation relates to outcomes of PA that can be cognitive, affective, and behavioural . Though this framework may apply to disabled people as well, the role of additional psychological factors must be considered. The psychological response to the highly stressful nature of MS is very important for the person’s quality of life. In particular, the individual’s beliefs regarding the uncertainty of the disease and the perceived intrusiveness on daily activities are important factors in depression, anxiety, and adjustment to the illness . Therefore, the investigation of resilience factors for the promotion of well-being of people with MS is a relevant task. A construct that has received increasing attention for stress reduction in the area of chronic illness is Mindfulness . This technique aims at mind-openness, or being aware that multiple perspectives are always possible. Therefore, a mindful attitude rejects the narrowing view of “bad” and “good”, as well as any other categories, including diagnostic labels. Initial findings in the literature and of clinical experience indicate a high potential for Mindfulness-based interventions (MBI) for the reduction of psychological suffering in pwMS [25-27]. The new intervention. Against this background, we developed a new model of intervention based upon the idea of a “brief High-Impact Preparatory Experience” (b-HIPE). Considering adherence to long-term MDR as one of the most challenging factors it was felt that a traditional hospital-based intervention would lack the necessary appeal and efficacy due to the present limits of the internal organization of national health services . Accordingly, the choice of the location was given special relevance to encourage pwMS dismiss the role of “patients” and achieve that of active participants. In the framework of an over-arching behavioral model such as the COM-B  the priority was given to an intervention strengthening motivation and appraisal. The opportunity came thanks to the collaboration with the Associazione “Acque Libere” based on the isle of La Maddalena and with the “Ente Parco Nazionale Arcipelago de La Maddalena” allowing us to address external motivation, stress reduction, team building, PA and competence enhancement. The collaboration with the Associazione “Cibo è Salute” based in Milan provided basic scientific knowledge on the effects of food on MS and the principles of healthy food selection, preparation and consumption. Finally, an expert psychologist introduced pwMS the principles and practice of mindfulness meditation. The above activities were complemented with on-site, group and individual physiotherapy and various social activities. Figure 1 shows how individual b-HIPE components map into the framework of the COM-B model. Figure 1: Shows how individual b-HIPE components map into the framework of the COM-B model. Once outlined, the program was submitted for main sponsorship. Funding and due authorizations were obtained in spring 2016. It was agreed that the program would have been classified as a pilot MDR with innovative characteristics-highly educational, of short duration but intense and appealing-aiming at increasing future participation to conventional MDR programs, daily PA, and to promote a healthy diet. The project would be implemented in two distinct phases with partially different aims and design. Part 1 (b-HIPEp1) would serve mainly to assess the feasibility of the approach and as an internal pilot, whereas Part 2 (b-HIPEp2) would serve to complete and validate preliminary results and follow up. Both phases would consist of at least three separate one-week editions with 5 to 6 pwMS at a time. The first edition of b-HIPEp1 tested the overall feasibility through qualitative responses of both pwMS and staff members. The second edition served to consolidate the schedule of the intervention, to introduce physiological monitoring and neuropsychological tests, and to correct a few issues that emerged in the first edition. The third edition served as a final check and to complete data collection for the analysis of outcomes. The three editions were separated each other by a 6 months period. In the present paper we describe the b-HIPE implementation steps, MDR components and main results of b-HIPEp1 feasibility and pilot studies. In future studies we will report on more comprehensive analyses of pwMS reported outcomes (PRO) and of objective measures collected in both phases, as well as the results of a 12-months followup. The b-HIPE is devoted to pwMS aged 20 to 65 years, with an EDSS ranging from 4 to 7. Included are pwMS with a BMI<36, who are on a western diet, on stabilized medical therapy and clinical conditions, with a motor control of upper limbs sufficient to maneuver a tiller. Heavy smoking, alcohol and drugs abuse, severe cognitive impairment, dysphagia and/or comorbidities requiring protected environments and specific medical assistance prevent inclusion. The b-HIPEp1 is a mixed educational-MDR with a "treatment” phase carried out in leisure environments, pre- and post-treatment phases in a hospital outpatients setting. The design of b-HIPEp1 conforms to a one-arm feasibility and pilot study with both patient reported outcomes (PRO) and objective measures. The protocol of b- HIPEp1 was approved by the local Scientific and Ethical Committee and informed consent was obtained from all participants. 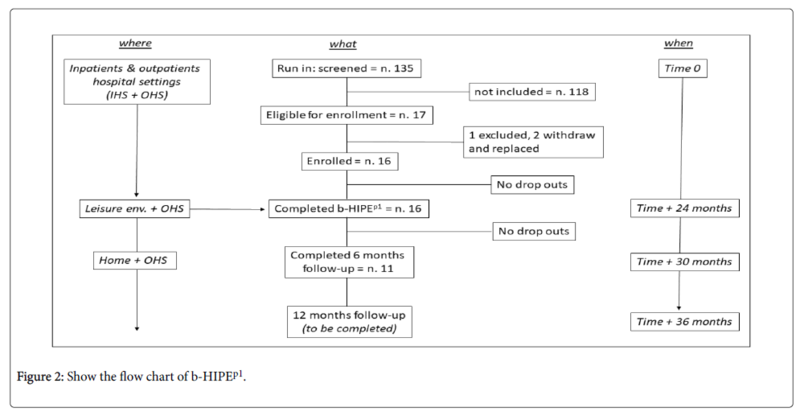 The schedule of enrolment, interventions and assessments of b-HIPEp1 is shown in Table 1. -5 months -4 weeks -1week +1week +1mo. +6mo. +12 mo. Table 1: Schedule of enrolment, interventions, and assessments of b- HIPEp1. Run-in: Three enrolments starting 5 months in advance of each b- HIPEp1 edition were carried out. Participation was offered to consecutive subjects referred to the MS Rehabilitation Unit of the S.Maria Nascente Scientific Institute of Milan meeting the above criteria, accepting to be the first to live a challenging experience in limited privacy living spaces, and willing to consider a change in their lifestyle. The aims, activities and implementation steps of the program were fully explained to candidate participants both during individual ambulatory visits by a neurologist (LM) and a physiatrist (CG) and again during a plenary briefing meeting. Relatives and caregivers were encouraged to attend and to grant their collaboration to support every participant’s efforts and motivation at home. They were explained that their temporary exclusion from the “treatment” phase was for both logistic - accommodation and insurance issues - and psychological reasons, as we wanted pwMS to bring back our message and become actors of a lifestyle change in their own family environments. Each enrolment phase continued until at least 5 pwMS were eligible. A maximum of 6 pwMS for each edition were enrolled due to accommodation limits in the destination facility. The “treatment” phase took place in the village of Stagnali (isle of Caprera) in northern Sardinia. Aside from its beauty and favorable climate, this location was chosen because its buildings-once a national navy facility-are suited to accommodate persons with moderate disability along with able individuals, so to foster group relationships and team-building that is hardly ever achieved in a hospital setting. The former navy buildings are close to the harbor of La Maddalena village where sailing classes and practice sessions took place. On any of the b-HIPEp1 editions a multidisciplinary staff shared the lodges and worked, eat, relaxed and slept with pwMS 24 h a day. The sanitary staff included one senior neurologist, one physical rehabilitation specialist, one nutrition specialist, one neurophysiology technician, two physiotherapists, and one nurse. The physiotherapists and nurse were changed on each edition. Two senior members of the sponsoring party, two professional sailing instructors, one chef, and four young volunteers recruited from local dual-training institutes completed the staff. The b-HIPEp1 schedule at Stagnali covered most the wake time across 5 consecutive weekdays, as the remaining two were spent on trips to and from the final destination. Five main activities were integrated in a typical b-HIPEp1 “treatment” day (see a representative daily schedule in Supplementary Information Table 1). a) Neuromotor rehabilitation in individual and group sessions was integrated with strategies to improve adaptation to the new environment, such as to control balance on a rolling boat or standing upwind in order to prevent falls without reducing mobility, and to reduce fatigue as well. The referring physician was responsible to adapt the above options to each participant’s specific needs and functional limitations. b) Diet: Since the day of departure from Milan all participants and staff members followed a controlled dietary regimen planned by our specialist and described in a previous paper . Three main meals and a mid-afternoon snack based on balanced mix of legumes, fresh and cooked seasonal vegetables and cereals were served daily prepared only with raw ingredients of guaranteed biological origin and cooked on site. Animal proteins were limited to fresh fish, poultry or eggs; all dairy products, alcohol, soft drinks, refined flour and sugars were avoided (see Table 2 in Supplementary Information). The participants were encouraged to attend the nutritionist teaching the basics of healthy cooking. c) The sailing course was regarded as the main attraction of the whole b-HIPE program. None of the participants to b-HIPEp1 have had previous experiences on a sailing boat and were fascinated by the opportunity to sail a real one. The Associazione “Acque Libere” has a longstanding experience in teaching sailing skills to disabled persons and its Base Nautica of La Maddalena is equipped with single- and double-seated monohulls (model Martin-16) designed to accommodate disabled sailors. The boats have top-rated safety features, do not capsize and are unsinkable. Every day participants attended a brief lesson to learn the basics of sailing before being eased on board for the real practice session. The latter was carried out in the still waters of the harbour under close control of the instructors and local volunteers on board of motorboats. The target was to make every participant able to sail on his/her own in optimal weather conditions. d) Mindfulness: mindfulness group sessions took place in late afternoon hours on a quiet beach; participation was extended to all staff members. Participants were first taught a respiratory technique to progressively relax, then were trained to visualize positive images and to feel the evoked bodily sensations. Finally, they were taught how to build positive memories to be kept at hand should psychological difficulties emerge in the future. e) Social climate: special attention was paid to promote open relations and to enhance active participation among all individuals at Stagnali village. This was achieved by sharing all the living spaces including dormitories and bathrooms – which remained separated only by gender -, by abandoning professional clichés and hierarchies, by preventing lone times, by replacing TV with group discussions and organizing cultural tours such as visits to museums, historical places, conferences on marine biology, and natural sightseeing. A link to a video clip with English subtitles featuring the environments and the main activities of b-HIPE is provided in Supplementary Information. We expected b-HIPEp1 to provide important information for a future controlled study. The overall feasibility of b-HIPE was assessed following published guidelines  by evaluating results of research team meetings and feedbacks of pwMS and staff members. Staff members were requested to record unwanted events derived by the use of the facilities, participants’ adaptation and complaints, side-effects of the dietary modifications, relational and communication problems, participants’ and staff’s suggestions to overcome contingencies, etc. The pilot study served mainly to assess whether the main processes– from screening to follow-up-run smoothly, to derive quantitative parameters for tuning of b-HIPEp2 design, and the sensitivity of the outcome measures and of other potentially useful measurements. The main objectives of feasibility and pilot studies are listed in Table 2. Table 2: Main objectives of the feasibility and pilot studies. 1. Free reports and self-rated questionnaires. Individual narrative reports were produced by participants at the end of every b-HIPEp1 edition. Anonymous feedbacks on the most important aspects of the experience were obtained on a 9-items visual analogue scale (VAS) satisfaction questionnaire which was later converted into a 0 to 10 interval scale. Another 11 items nominal questionnaire requiring either a binary response (yes/no; 6 items), an open-ended response (4 items) or the choice of 3 most appropriate sentences among a list of 14 summarizing the “core message” to be brought back home was also used (see a translated version in Supplementary Information). a) The FS-36 was chosen as the primary outcome as it is a widely used generic HRQoL questionnaire, known for its comprehensiveness, validity and reliability, and because it has been included in the Multiple Sclerosis Quality of Life Inventory . Indeed, a multidimensional rating instrument is suited to assess complex interventions such as b- HIPE. The SF-36 consists of eight scaled scores, which are the weighted sums of the questions in their section. The scales measure different aspects of health and are termed: physical functioning (PF), bodily pain (BP), role limitations due to physical health problems (RP), role limitations due to emotional problems (RE), general mental health (MH), social functioning (SF), energy/fatigue or vitality (VY) and general health perceptions (GH). We used the acute version of SF-36 by asking participants to refer to the past 2 weeks. To compare scales with different number of items raw scores are transformed into a 0-100 point scale so that the higher the score the less disability. We expected b-HIPE to significantly increase pwMS scores on at least 2 of SF-36 scales. For this study, scale totals have been also converted into z-scores using the published Italian norm  to obtain an overall SF-36 profile better reflecting our specific cultural perception of health-related issues. The Fatigue Severity Scale (FSS), the Berg Balance Scale (BBS) and the 9 Holes Peg test (9HPT) were the secondary outcome measures. b) The FSS is a PRO designed to differentiate fatigue from clinical depression and its 9-items relate to how fatigue interferes with certain activities. The items are scored on a 7 point scale, the higher the score the greater fatigue severity. A score of 4 is considered as an appropriate cutoff to identify clinically meaningful fatigue  and an individual variation of 1,9 points is required to detect a clinically important change (minimal detectable change or MDC) . c) The BBS is the most widely used instrument to assess balance in clinical and research settings. The Italian version has been validated  and has been shown to have a high responsiveness to change. The MDC for outpatients with MS has been recently established as an improvement of 2 points . d) The 9HPT  measures fingers dexterity and is part of the Multiple Sclerosis Functional Composite. Right and left hands are tested separately but only data from the dominant hand have been analyzed here. The suggested MDC for pwMS is a 20% change in the time to complete the test . Data of both primary and secondary outcome measures were collected on the weeks immediately before (t-1) the departure and after coming back (t+1) from the b-HIPEp1. Several other standardized PROs to assess fatigue, anxiety and depression, sleep quality, and MS-specific HRQoL, disability and symptoms were collected before and after the b-HIPEp1 week by all participants to the 2nd and 3rd editions; results will be reported in a successive paper along with those of b-HIPEp2. Long term actigraphic monitoring and heart rate, the 6 mins walking test (6MWT), the Stroop word-color interference test (SCWT), and the Mental rotation test (MRT) were administered to all participants to the 2nd and 3rd editions, before (t-1) the departure and within one week from coming back (t+1). Follow-up: Participants’ adherence to suggested diet, physical activity and other life-style modifications (e.g. refrain from alcohol, smoking, practice of stress-reducing meditation) was monitored on a monthly basis by means of internet exchanges and phone calls every month and during scheduled control visits at 6 and 12 months distance. Statistical analyses: Participants’ ratings on the SF-36 scale were the primary outcome variable. Because of the small sample size and ordinal nature of the data non-parametric statistics for paired observations (Wilcoxon test) with two-tail exact determination of probability and their respective effect size parameter Cohen’s r  were used to compare t+1 to t-1 ratings of the eight SF-36 scales. The interpretation of the effect sizes is generally based on the following intervals , where r ≤ 0.1 is considered a small effect, 0.3<r ≤ 0.5 a moderate effect, and r>0.5 a large effect; Wilcoxon Z values were also reported for comparison. In the case of FS-36 subscales the Bonferroni method was used to correct for multiple comparisons. Scores on the FSS, the BBS and on the 9HPT for the dominant hand were chosen as secondary outcomes and were tested for t+1 vs. t-1 differences by means of exploratory non parametric statistics for repeated measures without correction for multiple comparisons. Spearman’s rho was used to assess whether changes in outcome variables were correlated. The flow chart of b-HIPEp1 is shown in Figure 2. Of those deemed eligible, one subject was excluded due to heavy smoking and alcohol abuse not previously declared; two subjects withdraw because of privacy problems and were replaced. Figure 2: Show the flow chart of b-HIPEp1. No drop-outs occurred during the b-HIPEp1 weeks. A total of 16 patients, all followed by the MS Center of the Scientific Institute S. Maria Nascente of Milan, participated to one of three weekly editions of the b-HIPE p1 (Table 3). Table 3: Characteristics (means, standard deviations and counts) of the participants to the three editions of b-HIPEp1 (*RR+=relapsing-remitting with sequelae; SP=secondary progressive; PP= primary progressive; **DMD’s=Disease Modifying Drugs). The main purpose of the pilot study was to estimate the mean and standard deviation of the primary outcome measure, its sensitivity to change and that of other putative secondary outcomes, drop-out rates and short-term efficacy of b-HIPEP1 . SF-36 HRQoL. Significant (p.≤0.0062 after Bonferroni correction) t +1 vs. t-1 differences in the expected direction (t+1>t-1) were found on 4 out of 8 SF-36 scales: the RP (role physical), BP (bodily pain), VY (vitality) and MH (mental health); the SF (social functioning) scale fell short of significance and the PF (physical functioning), GH (general health) and RE (role-emotional) scales did not reach significance (Table 4). Scales with a large effect size in Cohen’s interpretation were the MH, the BP, the VY and the RP scales, while r values of all the remaining scales fell into the intermediate effect range. The mean percent scale difference on t2 assessments was +19% and the peak of improvement (+26%) was on the RP scale. Table 4: Outcome variables (*uncorrected for multiple comparisons; **data of b-HIPEP1 editions 2 and 3). After z-transformation using the Italian norms we found that at t-1 all SF-36 scales scored below the general population mean, whereas at t +1 most were above it (Figure 3), but a somewhat different pattern emerged, as the PF and the GH scales-though improved-remained below the reference mean while the VY scale showed the highest mean change of +1,2 standard deviations above the reference mean. Figure 3: Plot of SF-36 mean Z-scores before (t-1) and after (t+1) the experience at the nautical base in Sardinia. On the FSS, the t+1 vs. t-1 difference was significant at the p. ≤ 0.02 level with an intermediate effect size (r=0.44) and a median percent improvement of 18%. At t-1 there were eleven pwMS scoring an average of 4 points or higher (68.5%), whereas at t+1 only seven remained above this cutoff, of whom two scored only slightly above. At t-1 the FSS scores were significantly correlated with the SF-36 VY scale (Spearman’s rho=-0.49, p.=0.05), but the percent improvement (t+1- t-1) on the FSS was not correlated with that on the VY scale (Spearman’s ρ=0.088, p.=0.75) nor with that of any of the remaining SF-36 scales. The BBS and the 9HPT, showed significant differences on t+1 vs. t-1 comparisons with a large effect size. On the BBS 62.5 % of pwMS scored at or above the MDC whereas on the 9HPG only 5 pwMS (31%) scored at or above the MDC at the t+1 assessment. The percent improvement in the time to complete the 9HPT was significantly correlated with the improvement on the FSS (Spearman’s ρ=0.576, p=0.02). Though limited to 11 subjects, results of actigraphic recordings are summarized here (Table 4) to show that on t0 overall mean activity counts were increased during a.m. hours compared to t-1 and t+1. a) Satisfaction Questionnaire (VAS): An average score of 9.20 out of 10 was obtained on the 9 items assessing the quality of the facilities, the relationship with staff members, the food and the diverse activities proposed. The lower average score (8.5) was given to the buildings and the higher (9.7) was assigned to the social climate, followed by the sailing and the relations with staff. High average scores were also granted to the mindfulness sessions, the information concerning diet and the cultural activities (see Supplementary Information Figure 1). b) Satisfaction Questionnaire, nominal part: All 16 PwMS rated as positive to extremely positive the experience and stated they would recommend it to other pwMS. When asked if they would continue their participation to the core activities that were proposed, 15 were positive concerning physiotherapy, daily PA and healthy diet, 9 would try to keep on with sailing and 10 with meditation. All participants but one acknowledged that the experience has changed their perception of lifestyle issues along with several important aspects of their physiology such as sleep, bowel function, physical energy, and of their psychology and behavior such as motivation, mood, attitude, and mental efficiency. None reported having had any major difficulty adapting to the b-HIPE schedule. Finally, the statements “I should change my lifestyle (PA, food, psychological attitude)”, “I should increase my PA” and “I should learn to think positive” were most often selected as representative of the main messages received. Other frequently selected statements were those concerning the importance of knowing more about non-pharmacologic treatments of MS and to rely more on experts’ advice. c) Free reports (nominal): Because free reports contained only positive remarks and thoughts their content was preliminarily classified under the following themes: 1) enjoyment, 2) physical benefits, 3) motivation and other psychological benefits and reactions, 4) appraisal and knowledge, 5) resilience, 6) relationships and support 7) life projectuality (examples of participants’ quotes are reported in Table 4 of Supplementary Information). The “motivation and other psychological benefits” theme was most often present in pwMS reports and described as if they had recovered positive feelings about life thanks to the experience. A more in depth qualitative thematic analysis of free reports and of satisfaction questionnaires will be the subject of a following paper. d) Behavioral and clinical changes: Several changes of behavior were noticed by staff members or reported by pwMS. Of five previous smokers, two gave up smoking and did not relapse, whereas three reported occasional relapses. Fourteen out of sixteen participants passed the final solo-sailing test for basic skills in favourable weather conditions. The remaining two participants could learn the theory of sailing, but needed assistance on the boat because of visual impairments interfering with their correct estimation of distances. Two wheelchair-bound participants could resume an assisted ambulation for at least 5 meters. None of the participants had significant problems adapting to the new diet. Rather, immediate benefits were reported in terms of general well-being, sleep and energy; those regularly using antacid and laxatives could discontinue those treatments. At the end of b-HIPEp1 both pwMS and staff members reported that most significant clinical improvements concerned fatigue, spasticity, pain and clonus. Active participation of pwMS to every recreational, cultural, and rehabilitative activity has been complete, as no need for additional motivational interventions was reported by staff members. On the contrary, it was often necessary to cool down participants’ excessive enthusiasm while on the sailing boats. Concerning the social aspects, an unexpected “outcome” was the creation of an internet chat by the participants and caregivers, where the interactions between all participants and staff members established during b-HIPEp1 was given a chance to continue. An innovative MDRP -called b-HIPE- dedicated to pwMS with long-lasting illness and moderate-to-severe disability has been developed jointly by the Scientific Institute S.Maria Nascente of Milan and “Acque Libere”, a non-profit sports association based in Sardinia. The aim was to provide educational opportunities and promote motivation and behavioral changes to prevent/break the disengagement cycle that often limits the adherence of pwMS to standard hospital- or community-based rehabilitation . We reasoned that the chance of success of more traditional and prolonged hospital-based programs would be greatly increased if accessed by motivated pwMS, who are more conscious of their real physical limits and psychological resources and have already initiated behavioral adaptation following a preparatory experience. Thanks to volunteers and partner associations this complex program was successfully implemented in an environment where everyday lifestyle is far more ecological and involving than in a hospital setting. The b-HIPE is inspired by a general model of behavioural modification  where competence, motivation and opportunity need to interact effectively. It consists of five main areas of intervention: social climate, nutrition, physiotherapy and diverse physical activities, skill learning, and mental attitude. To the best of our knowledge, this is the first time a MDR for pwMS that includes high-impact activities such as sailing and mindfulness is carried outside traditional settings. We thought this choice would allow us to substantially reduce the duration of the intervention without missing the expected outcomes, and at the same time limit the influence of contextual factors (eg. hospital settings) which may reduce the generation of positive results. We also thought the temporary exclusion of care-givers could favor the role of pwMS as promoters of behavioral changes in their home environments. Our primary objective was to convey in the shortest time and the most effective way information dealing with lifestyle modifications pwMS need to understand. In this perspective, the most relevant results of b- HIPEp1 are those derived from participants’ reactions, behaviors and feedbacks. A total of 16 pwMS participated to the first three weekly editions, supported by a sanitary staff of 6 professionals and several volunteers who guaranteed the safety of participants 24 h a day. The feasibility study showed that the program can be proposed for an enlarged study with a few minor changes. The human and material resources allocated were adequate; the adopted selection criteria were not an obstacle to enrolment of a representative sample of pwMS among those who need long-term MDR. No issues concerning the acceptability and suitability of the procedures emerged, adherence and collaboration was complete during the study, and no safety issues emerged either. Finally, the intervention show promise of being successful with the intended population since preliminary analyses indicate that results are consistent with the overarching model of behavior modification, and that changes are in the expected direction. Turning to discuss each of the main areas of intervention, the introduction of evening mindfulness group sessions aimed at teaching the basics for a change in overall mental attitude and strategies to cope with stressors. PwMS granted high scores to mindfulness on the satisfaction questionnaire and a beneficial impact also emerged from narrative reports. Since mindfulness has been shown to increase pwMS’ scores on HRQoL and fatigue rating scales  its contribution to changes in our primary and secondary outcome variables may indeed have been significant. The role of a healthy diet in MS cannot be neglected any more [43,44]. In our experience, significant systemic and central anti-inflammatory activity results from the changes in the composition of resident gut microbiota brought about by the elimination of animal proteins, saturated fats and refined carbohydrates from the meals of pwMS . However, changing consolidated dietary habits is considered a very challenging task . We succeeded in making pwMS aware of the importance of changing their usual diet in a very short time, because we could practically demonstrate they should not sacrifice quantity or taste, but rather would gain on quality and overall well-being. Immediate benefits in terms of ease of digestion, gut physiology and reduction of gastro-esophageal reflux were reported by several participants. By teaching them how healthy meals should be prepared we also expected our participants to bring their relatives and care-givers the message. This goal was achieved in all but two cases, because relatives changed their mind and did not collaborate as originally agreed upon. Daily - mostly on morning hours - personalized and group physiotherapy was provided by experienced therapists and complemented with exercises to improve adaptation to specific environmental conditions. Previous work showed that the frequency with which pwMS seek active leisure is inversely related to mobility impairments . Restrictions in social participation are also most prevalent as more than 70% of persons with chronic disabling MS do not perform outdoor activities on a regular basis  though recent reports suggest that outpatients exercise programs are effective in improving functional measures . Our results suggest that pwMS have hidden resources that can be “mobilized” to let them carry on an active life, no matter how serious their disability; the most impressive example was a wheelchair bound pwMS who in a few days could resume an aided ambulation albeit for a short distance. Having experienced that participation to activities of unusual intensity increased their energy, participants have changed their attitude and reported a greater motivation to engage in physiotherapy and more generally in PA. Our main results further support this conclusion and actigraphic recordings showed that scheduled activities during b- HIPEp1 induced significant more PA compared to the reference periods, particularly during a.m. hours; interestingly, it has been reported that morning exercise is a viable strategy for promoting habitual PA in inactive patients . The sailing course has been a crucial component of the b-HIPE to enhance competence, self-esteem, projectuality and ultimately motivation in our participants. Led by capable instructors with specific experience in teaching disabled persons it succeeded in making almost all pwMS autonomous sailors in favorable weather conditions. Sailing has only recently proposed as a viable strategy to help pwMS strengthen resilience (see for example the “Oceans of Hope - Sailing sclerosis” project website) , but the absence of scientific accounts limits our understanding of how this activity is integrated with more traditional rehabilitative interventions and which outcomes have been planned and achieved. Likewise, we are not aware of any report of pwMS with significant disability taught solo-sailing small boats. Team sailing large boats with crews of both disabled and able persons supporting each other - as it appears to be more usual- introduces intuitive differences which may lead to somewhat different results. We thought a more individualized approach could be more efficacious considering the limited time available, and our preliminary results seem to support this view. Both participants and staff members reported that the sailing experience polarized much of the expectation, interests, discussions and projectuality. Results of participants’ feedbacks on the satisfaction questionnaire and free reports have been unanimously positive, often enthusiastic, again showing that by giving the opportunity in the right context a mobilization of psychological resources is obtained. As a consequence, participants have explicitly rated themselves as highly motivated to change their maladaptive behaviors such as poor PA, diet, smoking, poor adherence to rehabilitation programs and physicians’ suggestions, social withdrawal, etc. Turning to measured data, participants scored both their HRQoL and fatigue as improved after b-HIPEp1. On the SF-36, the main outcome variable, the changes on several subscale scores were generally in line with those reported after longer exposures of MS outpatients to physical or multidisciplinary rehabilitation. In fact, compared to most previous studies of MDR in MS outpatients using SF-36 as an outcome measure [51-55] mean and peak differences were larger in our dataset, except for a Swiss study that reported a higher peak value for the VY scale. After correction for general population mean, the Vitality scale was the most improved, further indicating that the b-HIPE has reached its main goal of mobilizing psychophysiological resources that are among the most penalized in pwMS along with those tapped by the Mental Health scale . Interestingly, it has been shown that the Vitality is not considered as relevant by the majority of neurologists while it is one of the most important scales in pwMS’ perspective . Fatigue is one of the symptoms most frequently addressed to by rehabilitation programs in pwMS. Recent reviews have underlined that this symptom can be ameliorated by exercise or behavioral modification programs [58,59], although exercise is more frequently proposed for less disabled people than behavioural change interventions. We found subjective fatigue ratings were improved on the FSS at t +1. Because the existence of significant fatigue was not a requisite for enrolment and because none of the proposed activities addressed fatigue specifically, this finding might be surprising. However, a subjective significant fatigue was declared by 11 out of 16 participants (68%) at t0, which is consistent with published surveys . Furthermore, the comprehensiveness of our approach may have tapped on some of the diverse mechanisms that are thought to sustain this symptom in MS . An enhanced physical exercise, a more efficient sleep, a healthy diet through its anti-inflammatory properties, a stress-management course together with an enjoyable social climate, are but a few factors that may have interacted in reducing fatigue. Future analyses on an enlarged pwMS sample should help elucidate which among ancillary variables not considered here can best explain fatigue amelioration. Among other secondary outcome variables, the 9HPT and the BBS showed the greatest improvement. The latter finding is not surprising since balance was specifically trained with standard daily exercises complemented with novel ones performed on a rolling motorboat or on ground in windy conditions. The large effect size on the 9HPT could be partly due to a practice effect, though its correlation with fatigue – which we also observed - has been already reported in pwMS  and might also explain our result. Findings of this study must be considered as preliminary because of several limitations intrinsic to pilot studies, such as a small sample size, the absence of a control group and of blinded assessments as well. A matched MS control group will be recruited for b-HIPEp2 and analysis of participants’ responses will be carried out by investigators blinded to group assignment. Indeed, we are aware that participants’ responses may have been influenced by the simple fact of being assessed or by the desire to please or impress the organizers and investigators-so called Hawthorne effect. The introduction of a control group should limit this potential bias during b-HIPEp2. Third, we failed to collect several measures from participants to the first edition of the b-HIPEp1, which further reduced the sample size for ancillary variables, prevented the selection of secondary outcome variables perhaps more sensitive to change and specific to MS, and to sort out which measures contributed most to the changes in the outcome variable. This limit will be also addressed to in the future editions of b-HIPE. A potential limit may have been the use of a generic measure of HRQoL instead of an MS-specific one. The advantage of a generic instrument is that it is widely used in the literature, allows comparing MS with other degenerative diseases, and performs as well as more specific instruments to predict disease progression . Admittedly, the presence of a control group might have reduced the strength of our results in terms of treatment effect size, though mean differences in our dataset are greater on most SF-36 subscales compared to previous studies using the same instrument. Noteworthy, some studies did not find significant changes in HRQoL scores when the same rehabilitation programs were offered to inpatients, presumably because the greater stress of hospitalization obscured the beneficial effect of the intervention on this measure [52,64]. Finally, caution must be used in the interpretation of SF-36 ratings as it may be complicated by the phenomenon of response set shift and the presence of functional items along with health items . This bias may be limited by the use of HRQoL instruments accounting for individual differences in appraisal of quality of life . Participants’ feedbacks and outcome measures confirm that a substantial recovery of motivation and projectuality can be achieved along with modifications of disadaptive behaviors by exposing pwMS to a brief MDR experience, which we called b-HIPE, in a stimulating leisure environment. Rather than a new rehabilitation modality, this strategy is intended as a preparatory experience to increase adherence and efficacy of long-term MDR programs for chronic MS. The creation of a dedicated chat further demonstrates an enduring interest in active participation to discussions and initiatives derived from the b-HIPE. We expect future editions of the b-HIPE not only to confirm these findings but also to demonstrate that this approach can significantly enhance the access and adherence of pwMS to long-term “traditional” rehabilitation programs. None of the Authors declare conflicts of interest. None of the authors, staff members and volunteers was paid to participate. The Authors are most grateful to all persons with MS who participated and provided feedbacks and to Dr. Andrea Camerino, President of the Rotary Club “Milano San Babila” who has enthusiastically supported this initiative and has actively participated to all its editions along with other rotarians. A special mention goes to Alessandra Cuccu, communication manager, who has produced all promotional materials, to Dr. Lara Scotto who led the mindfulness classes, and to Federica Mannoni and all volunteers of the association “Acque Libere”. Capt. Leonardo Deri, commissioner of the Ente Parco Nazionale of the Arcipelago of La Maddalena, is gratefully acknowledged for granting the facilities at the Stagnali village. Stennett A, De Souza L, Norris M (2017) Physical activity and exercise priorities in community dwelling people with multiple sclerosis: a Delphi study. Disabil Rehabil 10:1-8. Klaren RE, Motl RW, Dlugonski D, Sandroff BM, Pilutti LA (2013) Objectively quantified physical activity in persons with multiple sclerosis. Arch Phys Med Rehabil 94: 2342-2348. Kesserling J, Beer S (2005) Symptomatic therapy and neurorehabilitation in multiple sclerosis. Lancet Neurol 4: 643-652. Rasova K, Martinkova P, Pavlikoma M, Cattaneo D, Jonsdottir J, et al. (2015) Physical therapy provision in multiple sclerosis across Europe: a regional lottery? Eur J Phys Rehabil Med 51: 850-852. Fakolade A, Bisson EJ, Pétrin J, Lamarre J, Finlayson M (2016) Effect of comorbidities on outcomes of neurorehabilitation interventions in multiple sclerosis: a scoping review. Int J MS Care 18: 282-290. Heesen C, Bruce J, Gearing R, Moss-Morris R, Weinmann J, et al. (2015) Adherence to behavioural interventions in multiple sclerosis: follow-up meeting report ([email protected]). Mult Scler J Exp Transl Clin 1:1-4. Penwell-Waines L, Lewis K, Valvano A, Smith S, Rahn R, et al. (2017) Testing the health promotion model for adherence and quality of life in individuals with multiple sclerosis. Psychol Health Med 22: 205-211. Fakolade A, Lamarre J, Latimer-Cheung A, Parsons T, Morrow SA, et al. (2017) Understanding leisure-time physical activity: voices of people with MS who have moderate-to-severe disability and their family caregivers. Health Expect 21: 181-191. Patti F, Amato MP, Trojano M, Solaro C, Pappalardo A, et al. (2011) Multiple sclerosis in Italy: cost-of-illness study. Neurol Sci 32: 787-794. Ponzio M, Gerzeli S, Brichetto G, Bezzini D, Mancardi GL, et al. (2015) Economic impact of multiple sclerosis in Italy: focus on rehabilitation costs. Neurol Sci 36: 227-234. Grant WB, Trond R (2016) Multiple sclerosis. A lifestyle disease? Neurology 86:1275-1276. Smith K (2017) The evolving role of people with MS in clinical research-some progress but more is needed. Mult Scler 23: 1579-1582. Hedström AK, Olsson T, Alfredsson L (2016) Smoking is a major preventable risk factor for multiple sclerosis. Mult Scler J 22: 1021-1026. Briggs FB, Gunzler DD, Ontaneda D, Marrie RA (2017) Smokers with MS have greater decrements in quality of life and disability than non-smokers. Mult Scler J 13:1772-1781. Paz-Ballesteros WC, Monterrubio-Flores EA, de Jesús Flores-Rivera J, Corona-Vázquez T, Hernández-Girón C (2017) Cigarette smoking, alcohol consumption and overweight in multiple sclerosis: disability progression. Arch Med Res 48: 113-120. Bhargava P, Mowry EM (2014) Gut microbiome and multiple sclerosis. Curr Neurol Neurosci Rep 14: 1-8. Cosorich I, Dalla-Costa G, Sorini C, Ferrarese R, Messina M (2017) High frequency of intestinal T H 17 cells correlates with microbiota alterations and disease activity in multiple sclerosis. Science Adv 3: 1-9. Bagur MJ, Murcia MA, Jiménez-Monreal AM, Tur JA, Bibiloni MM, et al. (2017) Influence of diet in multiple sclerosis: a systematic review. Adv Nutr 8:463-472. Riccio P, Rossano R (2017) Diet, gut microbiota, and vitamins D + A in multiple sclerosis. Neurother 15: 75-91. Gråstén A, Watt A (2017) A motivational model of physical education and links to enjoyment, knowledge, performance, total physical activity and body mass index. J Sports Sci Med 16:31-327. Vallerand R, Lalande D (2011) The MPIC Model: the perspective of the hierarchical model of intrinsic and extrinsic motivation. Psychol Inq 22: 45-51. Deci E, Ryan R (2017) Self-determination theory. Basic psychological needs in motivation, development, and wellness. New York, NY: The Guilford Press. Mullins LL, Cote MP, Fuemmeler BF, Jean VM, Beatty WW et al. (2001) Illness intrusiveness, uncertainty, and distress in individuals with multiple sclerosis. Rehab Psychol 46: 139-153. Pagnini F, Phillips D (2015) Being mindful about mindfulness. Lancet Psychiatry 2: 288-289. Bogosian A, Hughes A, Norton S, Silber E, Moss-Morris R (2016) Potential treatment mechanisms in a mindfulnes-based intervention for people with progressive multiple sclerosis. Br J Health Psychol 21: 859-880. Simpson R, Byrne S, Wood K, Mair FS, Mercer SW (2017) Optimising mindfulness-based stress reduction for people with multiple sclerosis. Chronic illness 1:1-13. Cavalera C, Pagnini F, Rovaris M, Mendozzi L, Pugnetti L, et al. (2016) A telemedicine meditation intervention for people with multiple sclerosis and their caregivers: study protocol for a randomized controlled trial. Trials 17: 1-6. Tacchino A, Brichetto G, Zaratin P, Battaglia MA, Ponzio M (2017) Multiple sclerosis and rehabilitation: an overview of the different rehabilitation settings. Neurol Sci 38: 2131-2138. Saresella M, Mendozzi L, Rossi V, Mazzali F, Piancone F, et al. (2017) Immunological and clinical effect of diet modulation of the gut microbiome in multiple sclerosis patients: a pilot study. Front Immunol 25: 1-11. Orsmond GI, Cohn ES (2015) The Distinctive Features of a Feasibility Study: Objectives and guiding questions. OTJR 35: 169-77. Ritvo P, Fischer J, Miller D, Andrews H, Paty D, et al. (1997) Multiple sclerosis quality of life inventory: a user’s manual. National Multiple Sclerosis Society: 1-65. Apolone G, Mosconi P (1998) The Italian SF-36 Health Survey: translation, validation and norming. J Clin Epidemiol 51: 1025-1036. Valko PO, Bassetti CL, Bloch KE, Held U, Baumann CR (2008) Validation of the fatigue severity scale in a Swiss cohort. Sleep 31: 1601-1607. Learmonth YC, Dlugonski D, Pilutti LA, Sandroff BM, Klaren R, et al. (2013) Psychometric properties of the fatigue severity scale and the modified fatigue impact scale. J Neurol Sci 331: 102-107. Ottonello M, Ferriero G, Benevolo E, Sessarego P, Dughi D (2003) Psychometric evaluation of the Italian version of the Berg balance scale in rehabilitation inpatients. Eur Med Phys 39: 181-189. Gervasoni E, Jonsdottir J, Montesano A, Cattaneo D (2016) Minimal clinically important difference of Berg balance scale in people with multiple sclerosis. Arch Phys Med Rehabil 98: 337-340. Mathiowetz V, Weber K, Kashman N, Volland G (1985) Adult norms for the nine hole peg test of finger dexterity. Occ Ther J Res 5: 24-38. Schwid SR, Goodman AD, McDermott MP, Bever CF, Cook SD (2002) Quantitative functional measures in MS: what is a reliable change? Neurology 58: 1294-1296. Fritz CO, Morris PE, Richler JJ (2012) Effect size estimates: current use, calculations, and interpretation. J Exp Psychol Gen 141: 2-18. Cavalera C, Rovaris M, Mendozzi L, Pugnetti L, Garegnani M, et al. (2017) Online meditation training for people with Multiple Sclerosis: a randomized controlled trial. Mult Scler J 1: 1-8. Riccio P, Rossano R, Larocca M, Trotta V, Mennella I, et al. (2016) Anti-inflammatory nutritional intervention in patients with relapsing-remitting and primary-progressive multiple sclerosis: a pilot study. Exp Biol Med 241: 620-635. Fitzgerald KC, Tyry T, Salter A, Cofield SS, Cutter G, et al. (2017) Diet quality is associated with disability and symptom severity in multiple sclerosis. Neurology 90: 1-11. Bisht B, Darling WG, Grossmann RE, Shivapour ET, Lutgendorf SK, et al. (2014) A multimodal intervention for patients with secondary progressive multiple sclerosis: feasibility and effect on fatigue. J Altern Complement Med 20: 347-355. Yorkston KM, Kuehn CM, Johnson KL, Ehde DM, Jensen MP, et al. (2008) Measuring participation in people living with multiple sclerosis: a comparison of self-reported frequency, importance and self-efficacy. Disabil Rehabil 30: 88-97. Cattaneo D, Lamers I, Bertoni R, Feys P, Jonsdottir J (2017) Participation restriction in people with multiple sclerosis: prevalence and correlations with cognitive, walking, balance, and upper limb Impairments. Arch Phys Med Rehabil 98: 1308-1315. Bond DS, Raynor HA, Thomas JG, Unick J, Webster J, et al. (2017) Greater adherence to recommended morning physical activity is associated with greater total intervention-related physical activity changes in bariatric surgery patients. J Phys Act Health 14: 492-498. Patti F, Ciancio MR, Reggio E, Lopes R, Palermo F, et al. (2002) The impact of outpatient rehabilitation on quality of life in multiple sclerosis. J Neurol 249: 1027-1033. Pappalardo A, D’Amico E, Leone C, Messina S, Chisari C, et al. (2016) Inpatient versus outpatient rehabilitation for multiple sclerosis patients: effects on disability and quality of life. Mult Scler Dem Dis 1:1-7. Kerling A, Keweloh K, Tegtbur U, Kück M, et al. (2015) Effects of a short physical exercise intervention on patients with multiple sclerosis. Int J Mol Sci16: 15761-15775. Bjarnadottir OH, Konradsdottir AD, Reynisdottir K, Olafsson E (2007) Multiple sclerosis and brief moderate exercise. A randomised study. Mult Scler 13: 776-782. Mostert S, Kesselring J (2002) Effects of a short-term exercise training program on aerobic fitness, fatigue, health perception and activity level of subjects with multiple sclerosis. Mult Scler 8: 161-168. Carnero Contentti E, Genco ND, Hryb JP, Caspi M, Chiganer E, et al. (2017) Impact of multiple sclerosis on quality of life: comparison with systemic lupus erythematosus. Clin Neurol Neurosurg 163:149-155. Ysrraelit MC, Fiol MP, Gaitán MI, Correale J. (2018) Quality of life assessment in multiple sclerosis: different perception between patients and neurologists. Front Neurol 11:718-729. Asano M, Berg E, Johnson K, Turpin M, Finlayson ML (2015) A scoping review of rehabilitation interventions that reduce fatigue among adults with multiple sclerosis. Disabil Rehabil 37:729-738. Wendebourg MJ, Heesen C, Finlayson M, Meyer B, Pöttgen J, et al. (2017) Patient education for people with multiple sclerosis-associated fatigue: a systematic review. PLoS One 12:1-14. Weiland TJ, Jelinek GA, Marck CH, Hadgkiss EJ, van der Meer DM, et al. (2015) Clinically significant fatigue: prevalence and associated factors in an international sample of adults with multiple sclerosis recruited via the internet. PLoS One 10: 1-18. Newland P, Starkweather A, Sorenson M (2016) Central fatigue in multiple sclerosis: a review of the literature. J Spinal Cord Med 39: 386-399. Chahin S, Miller D, Sakai RE, Wilson JA, Frohman T, et al. (2015) Relation of quantitative visual and neurologic outcomes to fatigue in multiple sclerosis. Mult Scler Relat Disord 4: 304-310. Baumstarck K, Pelletier J, Butzkueven H, Fernández O, Flachenecker P, et al. (2013) MusiQoL study group. Health-related quality of life as an independent predictor of long-term disability for patients with relapsing-remitting multiple sclerosis. Eur J Neurol 20:907-914. Romberg A, Virtanen A, Ruutiainen J (2005) Long-term exercise improves functional impairment but not quality of life in multiple sclerosis. J Neurol 252: 839-845. Schwartz CE, Andresen EM, Nosek MA, Krahn GL (2007) RRTC expert panel on health status measurement. Response shift theory: important implications for measuring quality of life in people with disability. Arch Phys Med Rehabil 88: 529-536. Rapkin BD, Garcia I, Michael W, Zhang J, Schwartz CE (2017) Development of a practical outcome measure to account for individual differences in quality-of-life appraisal: the brief appraisal inventory. Qual Life Res 27: 823-833. Copyright: © 2018 Pugnetti L, et al. This is an open-access article distributed under the terms of the Creative Commons Attribution License, which permits unrestricted use, distribution, and reproduction in any medium, provided the original author and source are credited.